Let us imagine a woman that has to sell her produce at the market. She must travel quite some distance to reach the market, a journey that involves crossing a river by means of a rickety rope bridge. The burden she carries is heavy, the crossing of the river treacherous. Indeed, there is no certainty that she will find buyers for her produce. Yet, the hope of profit is what sustains her as she makes this trip to the market. In the final analysis however, all her hopes and aspirations for profit may be realized only if she successfully crosses the bridge. 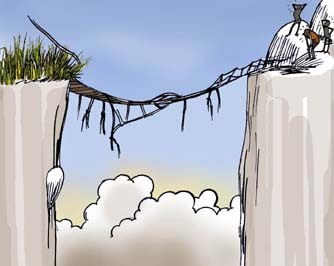 The Rope Bridge is the story about how we manage political transition in our country. Shall Uganda consolidate the peaceful gains made in recent years and take bolder strides into the future, or shall it stagnate, or perhaps even regress? The challenge is immense and what matters is the quality of the decisions we make in this critical transition period when we are bearing both the burden of our history and the aspirations and challenges of the future. The bridge we must cross is equally rickety. How we balance our burdens as we attempt to make the crossing shall determine if we will make the crossing safely. As we make this journey, we have to decide what we will take with us and what we must leave behind. The story begins with Ugandans looking to the future with a mixture of optimism and anxiety as constitutional and political reforms unfold. In spite of positive changes such as the restoration of multiparty politics, a strengthened parliament and judiciary, a restructured and disciplined military and the improved Local Council system, the majority of the population remains suspicious and mistrustful of these transformations. Yet, these changes are gestures that inspire and signal hope for the future. The elections in 2006 attract several parties – some new, others old. After two decades of single-party rule, Ugandans are optimistic that fundamental institutional and economic reforms will follow the political transition. The political parties compete on populist platforms promising reforms, but at the same time are inadequately prepared for competitive politics. Frustrations emerge and tensions dominate the campaign period with settling old political scores high on the agenda. Old prejudices are rekindled and it seems that pluralist politics is following in the path of conflict and bloodshed that has accompanied it in the past. Amidst the mistrust and tension, the Electoral Commission is accused of being partial when voting periods are extended in some remote and hard to access regions. Despite these tensions, the 2006 elections conclude successfully and are hailed as yet another successful transition in Africa. A newly elected government is installed, but in a climate of simmering tensions. It would appear that the first section of the rope bridge has been successfully crossed. However, has the bitterness of the campaign period weakened this rope bridge? On the outside, it seems that everyone is excited and hopeful that the transition heralds a new era. The election has been given the imprimatur of success by the international community resulting in continued inflow of investment and donor support. Programmes to combat AIDS and other diseases are widened, investments result in increased employment opportunities and the problem of Northern Uganda is tackled as international efforts bring the conflict there to an end. The price of all of this support is pressure for additional reforms, which the government promises. Uganda, it would seem, is moving forward. However, unspoken fears run deep. Many people remain insecure and uncertain of the new leadership. Mistrust along ethnic and religious grounds deepens – albeit silently. The ghosts of the past however refuse to remain buried. In spite of efforts to bring it under control, corruption remains as vicious as before and limits real gains. Sectarianism persists as officials and politicians reward their supporters and relatives with top positions in public sector organizations thus compromising effective service delivery. Those left out are disgruntled. Cultivation of ethnic ties is critical to accessing employment and wealth. Those excluded long for “their turn” in power. This creates hatred and divisions which the government is unable to reduce. Those who are beneficiaries of the government largesse give their unwavering support to the government, encouraging continued corruption and poor governance. This stifles government’s attempts to push through the reforms it had promised in its manifesto. In the medium and long run, the needs of the poor remain ignored with poverty deepening. By 2011, the population has lost confidence in the government. Regional inequalities, corruption and ethnicity have persisted, poverty has not reduced and livelihoods have not improved. Dissatisfied and angry, the population begins to agitate for reform as they blame the politicians for letting them down. Pushed to the wall, the government increasingly resorts to ‘securitized’ approaches to dealing with dissent. As the elections approach in 2011, the political space is circumscribed and opposition parties stifled. The incumbent government triumphs in the subsequent elections that are widely considered to have been rigged. With popular resentment on the increase and spilling over into the streets, the military once again comes ‘to the rescue’ to protect the government. Dealing with dissent with a heavy and brutal hand, stories of human rights abuses abound as civil rights are stifled. The media is harassed and censorship becomes a way of life for the media. Pliable opposition politicians are bought off; those of firmer conviction are intimidated. Despite the intimidation and harassment, the people refuse to give in and constantly challenge the regime to uphold the rule of law and to respect its human rights obligations. In 2013, an attempt to hold a peaceful rally to protest the government’s actions is forcefully broken up by the army resulting in many injuries, deaths and imprisonments. This event fuels even more anger and sparks more protests increasing the pressure on the government. Isolated and increasingly vulnerable, the government declares a state of emergency. State inspired insecurity reigns. With the opposition silenced or exiled, the security forces and their colleagues in power take advantage of the situation to loot state coffers for their own benefit. Social unrest is rife in urban areas. The livelihoods of the rural poor are increasingly fragile as they eke a living off ever less fertile land parcels. They are largely ignored by the state and remain the concern of religious and other non-governmental groups. Environmental destruction continues at ever-increasing pace as the poor search for fuel. The Universal Primary Education (UPE) project has fallen into decay and is threatening to collapse at any time – as is the health care system. Critical funds for social services are continually diverted into political and ‘security’ projects to benefit a small palace coterie and their supporters. By 2016, the support for the government is at its lowest. The rope bridge is frayed and weak. Can it continue to hold the weight of the nation? It would seem that Uganda is on a downward spiral. The government is no longer preoccupied with national development issues but more with personal survival. Corruption is out of hand as favours are bought and traded openly. The economy stagnates, the environment plundered. Powerful businessmen in alliance with powerful military officers evade taxation and to meet the shortfall in revenues, taxes are increased – to the annoyance of an already overburdened tax-paying population. Investors withdraw and unemployment increases with concomitant increases in poverty. Even as the majority slides deeper into poverty and squalor, a small group of people continues to flourish, living in pomp and majesty. When the 2020 elections are cancelled, there is an immediate backlash taking form of internal outrage and international condemnation of the government. The rope bridge is barely holding together as Ugandans stare at the abyss below. Ugandans in exile advocate an uprising against the government. The population is in favour with many groups agitating for a change of government. But people in these groups dread the possible consequences and, lacking strong internal leadership or the means to realize their ambitions, they do not act. Instead, despite their shared grievances these groups remain divided along regional, ethnic and ideological lines. Mistrust runs deep with accusations and counter-accusations punctuating the atmosphere between them. They point out the ancient mistakes rival groups made when they were in power years earlier and on this basis, write them off. Sometimes a group or leader is not supported because they come from a region that others dislike and mistrust. This weakens the opposition to the advantage of the government. Having tried and failed to effect change from within, a segment of the military, fed up with the status quo, rebels against the government. They successfully encourage the other groups to unite and join them. Tacitly backed by neighbouring countries and an international community disillusioned with the government and the simmering popular revolt at home, a military onslaught on the government is launched. It progresses rapidly, and after a short period of turmoil and chaos, the government falls and is replaced by a broad-based coalition of political forces. 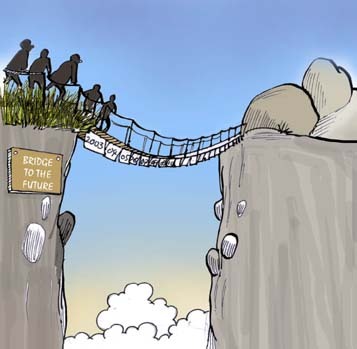 By 2025, the rope bridge to Uganda’s future is still in place, but in dire need of repairs. Uganda’s infrastructure has crumbled after years of neglect, the economy in ruins, social systems and structures badly damaged. The painful experiences of conflict and lost gains make Ugandans slow to find ways and means to heal the breaches of the past. Yet, the new government promotes national reconciliation and consensus building. Ugandans in exile slowly trickle back home to contribute to the process of rebuilding the nation. The international community contributes funds and technical expertise to this process. Under the supervision of the African Union, a National Conference is convened and brings together Ugandans from all walks of life to plan a future development path for the country. The Conference, working hard to chart the road map to the future confronts difficult moments, as it has to overcome some of the most contentious issues that have divided the country. Even as the delegates’ work and the country watches, the key questions in people’s minds are: Can we trust each other? What do we really want as a country? Can we live together harmoniously? What if the new political class repeats the same mistakes, will we all return to chaos again?